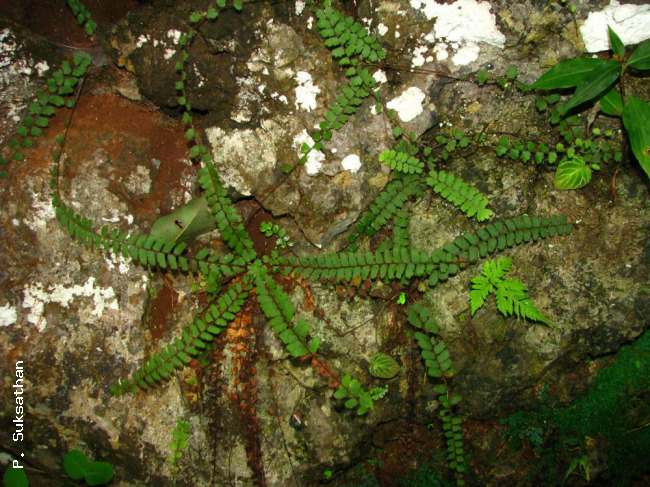 Adiantum caudatum L., Mant. Alt. : 308. 1771; Bedd., Handb. Ferns Brit. India: 83, f. 44. 1883; Hosseus, Beih. Bot. Centr. 28(2): 363. 1911; E.Smith, J. Siam Soc. Nat. Hist. Suppl. 8: 3. 1929; Tardieu & C.Chr., Fl. Indo-Chine 7(2): 180. 1940; Holttum, Rev. Fl. Malaya ed. 1, 2: 599, f. 351. 1955 [‘1954’]; Holttum, Rev. Fl. Malaya, ed. 2, 2: 638. 1968; Holttum, Dansk Bot. Ark. 20: 33. 1961; Holttum, Dansk Bot. Ark 23: 244. 1965; Ching, Acta Phytotax. Sin. 6: 313. 1957: Seidenf., Nat. Hist. Bull. Siam Soc. 19: 87. 1958; Tagawa & K.Iwats., SouthE. Asian Stud. 5: 109. 1967; Tagawa & K.Iwats., Fl. Thailand 3: 207. 1985; Boonkerd & Pollawatn, Pterid. Thailand: 117. 2000; Newman et al., Checkl. Vasc. Pl. Lao PDR: 31. 2007. Adiantum malesianum Ghatak, Bull. Bot. Surv. Ind. 5: 73, f. 1, 4. 6–7. 1963; Holttum, Rev. Fl. Malaya, ed. 2, 2: 638. 1968. Terrestrial or lithophytic. Rhizome short, erect, covered with scales; scales linear, 4–6.5 mm long, 0.3–0.5 mm wide, bicoloured with a black centre and pale brown margin, margin entire or with very occasional minute tooth. Stipes 1–15 cm long, castaneous to black purple, polished, densely hairy with long multicellular uniseriate brown hairs, scaly at base. Laminae linear-lanceolate, pinnate, long-tailed at apex, 8–35 by 1.8–4 cm; rachis densely hairy on upper surface with paler stiff hairs, prolonged, leafless on apical part, rooting at tip; lateral pinnae 20–44 pairs, gradually becoming smaller upwards, the lower ones smaller and reflexed; largest pinnae sessile, almost parallelogram-shaped, round at apex, lower margin almost straight, upper margin nearly parallel to it, inner edge straight, to form narrowly cuneate base with lower margin, 7–20 by 4–10 mm, upper and outer margins deeply lobed to more than half the width of pinna, forming narrow lobes, and narrow sinus; lobes including 2–5 veinlets, subtruncate and slightly toothed at apex, entire at margin; papyraceous, hairy on both surfaces, lower surface with short and long hairs, upper surface with stiff hairs; veins prominent. Sori on apices of lobes, the reflexed flaps narrow, hairy . NORTHERN: Mae Hong Son, Chiang Mai, Chiang Rai, Lampang, Phrae, Tak, Phitsanulok; NORTH-EASTERN: Loei, Nong Khai; EASTERN: Chaiyaphum, Nakhon Ratchasima; SOUTH-WESTERN: Kanchanaburi, Prachuap Khiri Khan; CENTRAL: Phra Nakhon Si Ayutthaya, Saraburi; SOUTH-EASTERN: Chon Buri, Chanthaburi; PENINSULAR: Chumphon, Surat Thani, Phangnga, Nakhon Si Thammarat, Phatthalung, Trang, Satun, Songkhla, Pattani, Yala. Kampot, Mondulkiri, Pursat, Siem Reap. Tropics of the Old World in general, from Africa to Polynesia. On rather dry slopes or often on muddy limestone usually in dry deciduous forests up to 1000 m altitude throughout Thailand. Van Beusekom et al. 4134, Chaiyaphum, Nam Phrom (P). Petelot s.n., Khammouane, Kouan Pha Vang (P); Vidal 2526, Louang Phrabang, between Ban Sing & Ban Na Sao (P). Geoffray 148, Kampot, Pnom Dong (P); Long et al. CL353, Mondulkiri (P); Schmid 183, Siem Reap, Bayon (P).